Our Open House offers all area reef clubs, hobbyists, and other interested members of the community a unique, one-of-a-kind aquatic experience. Visit our LiveAquaria® Coral Farm & Aquatic Life Facility and enjoy an educational and fun-filled day. Learn more about our facility, exchange ideas with fellow hobbyists, take part in our raffle, and take advantage of an opportunity-of-a-lifetime to purchase quality aquatic life directly from the source! Please include all participants' names, addresses, emails and phone numbers. Openings are reserved on a first-come-first-serve basis. Space is limited, and openings fill up quickly so reserve your spot today! During the duration of our Open House, reef clubs, hobbyists, and other interested members of the community are free to leisurely view all of the animals in our facility, ask questions, and PURCHASE any of the aquatic life (excludes display animals and already-sold Diver's Den® aquatic life) housed in our facility (open-house purchasing). At 1:00 pm, a one-hour Guided Educational Tour is scheduled if you would like an in-depth behind-the-scenes tour of our facility. Learn about our history, lighting technology, filtration equipment and an explanation of its functions, fish, coral, and invertebrate life support systems, extensive acclimation, quarantine, and conditioning procedures, and how we package the animals for safe transit. Open House Tour Discounts may not be combined with any other discounts. Please Note: Purchases and raffle prizes must be taken home the day of the tour. The only accepted forms of payment are a valid credit card or LiveAquaria® gift certificate. Our LiveAquaria® team will be present to answer questions and consult with guests. Children under 16 years of age must be accompanied by an adult and supervised at all times. First opened in July, 2005, the LiveAquaria® Coral Farm & Aquatic Life Facility is one of the nation's premier coral propagation facilities. Our cutting-edge facility employs the most sophisticated technology in lighting, filtration, water movement, and quarantine systems to ensure the hardiest and disease-free coral and fish selection for home aquariums. Our staff of aquatic experts and diagnostic specialists personally oversee the health of all of the aquatic life housed in Rhinelander, WI. Designed by LiveAquaria® Director Kevin Kohen, this unique facility is dedicated to education, conservation, and the advancement of the hobby through best practices and smart choices. LiveAquaria is proud to offer reef, marine, and freshwater aquarium enthusiasts one of the largest selections of premium captive grown, aquacultured, and maricultured aquatic life. Through our successful efforts in coral propagation, an ever-increasing number of LiveAquaria Certified Captive Grown Corals (CCGC) are available for reef hobbyists. We are so confident in our hardy aquacultured corals that each CCGC frag comes with a Certificate of Authenticity and an industry-leading 30-day guarantee. The LiveAquaria® Coral Farm & Aquatic Life Facility is also home to the exclusive Diver's Den® WYSIWYG (What-You-See-Is-What-You-Get) Store. 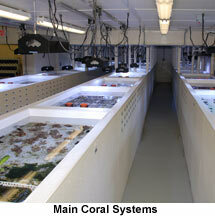 Our holding systems house a prized selection of hard-to-find fish, corals, and invertebrates. Each species is quarantined, conditioned, and then photographed for sale so what you see is TRULY what you get.